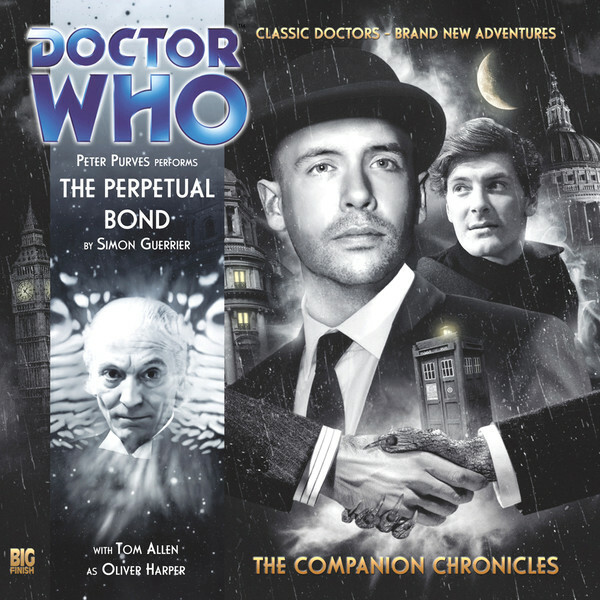 Big Finish: THE PERPETUAL BOND Review | Warped Factor - Words in the Key of Geek. Big Finish is a company that has evolved its storytelling in an unusual way. Beginning with the Fifth, Sixth and Seventh Doctors, it took the idea from the Virgin New Adventures novels that the Doctor had other companions after Ace, and it normalised the idea of fitting brand new companions, who could bring brand new challenges and characteristics to each Doctor’s life, into the timeline at various points – the Fifth Doctor gained Erimem, the Sixth Doctor gained an ever-growing host of additional friends, from Dr Evelyn Smythe to Constance Clarke, via Frobisher the Whifferdill, and the Seventh Doctor gained the Nazi and the Nurse, Klein and Hex, among others. When the Eighth Doctor series began, it was absolutely a necessity to invent him some new companions, and so Charlotte Pollard, C’rizz, Lucie Bleedin’ Miller, Tamsin Drew, Molly O’Sullivan and Liv Chenka joined the audio world, expanding the Doctor’s horizons, and everyone took it as read that of course the Doctor probably had companions that we’ve never seen on-screen. They have the adventures we haven’t seen, the adventures in our head that come out in other ways, on other media. So it’s peculiar that the first four Doctors are relatively sacrosanct in terms of their companions, especially since with the best will in the world, the companions of the first four Doctors are advancing in years – a point tragically proven in a recent handful of years by the loss of Caroline John, Elisabeth Sladen, and Mary Tamm. Then, as if out of nowhere, along came the Oliver Harper Trilogy. Three stories featuring the First Doctor, Steven Taylor…and a brand new audio-only companion. More particularly to the point, having listened to the three audio stories in the trilogy, the question should be asked: why hasn’t it happened again? Oliver Harper, introduced in The Perpetual Bond and played by Tom Allen, looks to all the world like a typical sixties city type, working on the trading floor in London. But Harper has secrets. Harper is scared. Harper is moments away from fleeing the forces of justice, for a crime he’s committed, but for which he cannot face the music. Which may be why he thinks his boss has suddenly turned into a giant mushroom. The First Doctor and Steven, in Simon Guerrier’s ground-breaking Companion Chronicle, finally find their way back to 1960s London, and even to the junk yard of IM Foreman in Totter’s Lane, but while looking for a phone box that isn’t a bigger-on-the-inside time machine, so as to try and re-unite with Ian and Barbara, they see an alien catch a bus, and take off in hot pursuit. Events take them to the trading house where Oliver works, and a moment’s unwise honesty binds them in an understanding that none of them are going mad, and that yes, there appear to be mushrooms walking around in bowler hats, carrying rolled umbrellas, just as though it were the most natural thing in the world. It emerges that there are others trading commodities at the Flowers Trade And Investment. They’re doing it better than anyone else, and they’re doing it with a cynicism about what constitutes a commodity that one would probably optimistically hope was the province of the alien. The Doctor, Steven and Oliver unite to try and put a stop to a giant operation that has something uncomfortably historical about its resonances, but the three could well be up against more than they can handle. Guerrier’s story is written with a pulsing intelligence – he places the story firmly in the timeline of Steven and the Doctor, just after The Daleks’ Master Plan, with Steven still mourning for friends so recently made and lost – Katarina, Brett Vyon, Sara Kingdom (this last becoming a particularly poignant loss following stories released later in which Steven and Sara are trapped, again in sixties London, for some time – see An Ordinary Life). Guerrier writes great Steven, translating the space pilot’s view of the world into his experiences in what he thinks of as ‘ancient London,’ and also filling in those experiences with details picked up from previous London-based Steven stories like The Suffering. And Peter Purves relishes the chance to put some extra solid companioning into the character, beyond his often-limited on-screen role of ‘fighter of bad guys and schlepper from here to there.’ As the story is half narrated from his point of view, it allows Steven to give us genuine new insights into the Doctor, his own life, his past and experiences, and the ways in which this travel to historical worlds can be tiresome for a space pilot used to an entirely different life. But it’s Tom Allen who most captures our attention here as Oliver Harper, the young man with a secret, happy in the anonymity of the trading floor, where everyone is judged not by who they are or where they’ve come from, but by the measure of their success at their job. While this is still very much a Doctor Who story, and it’s the Time Lord who eventually comes up with a solution to the nasty business being done at Flowers’, it’s a Companion Chronicle too, and both of them are written and delivered exceptionally well. Allen slips into the story with a seemingly effortless ease, and does what no-one’s done since the sixties – added a whole new ripple into the First Doctor’s life. Oliver Harper is that most interesting combination of things – a character on the run from the law for reasons we don’t find out until his second story, The Cold Equations, but who the Doctor takes on trust. We hear enough of him in The Perpetual Bond to put our trust in him too, for all it’s as yet a somewhat guarded trust. In terms of the First Doctor’s timeline of course, a character like Oliver Harper is an irresistible new creation. The grumpy, rash old man who kidnapped two school teachers has been heartbroken by the necessity of letting his granddaughter go, has picked up a surrogate grandchild to help him ease the pain, and recently had to let her go too. The teachers left him at the first opportunity they really got, despite growing as fond of him as he was of them, and he’s picked up a young space pilot because the alternative was to leave him to rot in a battle between the Daleks and the Mechanoids. Those choices, those losses, added to the sudden, shocking deaths of people around him in the immediate past, the losses of Katarina, Brett and Sara, have hit the old Time Lord hard, and his response here is to trust. It’s possibly a degree of retroactive character rewriting to see him as having mellowed into that trust, there’s also something inherently logical about the Doctor’s decision even as he was written in the sixties. Oliver Harper is a member of a privileged elite, who needs to flee the judgment of his own people. There’s something distinctly Doctorish in his story, so the Doctor’s decision to offer him an escape route makes sense as a kind of Pay It Forward move, the Doctor who found his escape in the Tardis, pays that fortune forward to Oliver and takes him into time and space. While we’re not far enough removed from the sixties yet to view them as Steven does, as ‘ancient history,’ we’re at least far enough removed to share the Doctor’s perspective that the law and justice are not necessarily the same thing in that period (or in any period, come to that). So the Doctor takes a chance and trusts Oliver Harper, making a new friend rather than leaving him to his fate. In all three of Guerrier’s scripts featuring the London trader, there’s a richness of character-development that was never given the chance to appear on-screen in the genuine Hartnell era. Thankfully then, Big Finish makes the character of the audio First Doctor broader and better than he ever had time to be on TV, and both Steven and Oliver are far richer in terms of their backstory than the lens would ever have allowed. Pick up The Perpetual Bond without even a moment’s hesitation. But be warned – get The Perpetual Bond and you’re in for all three Oliver Harper stories. The young trader won’t let you go until his tale is well and truly done.